Steiner Optics 416 Military 15x80 Model 416 Binoculars with Compass FREE SHIPPING! The Steiner Optics Model 416 Military 15x80 binocular provides the long-range viewing capacity of a spotting scope in a more compact and comfortable platform. The huge objective lenses and premium, multi-coated optical system deliver clear, high-contrast images even at extreme range, and provide enough light transmission for superior performance in low-light conditions. Its Sports-Auto Focus system provides sharpness at all ranges from a simple one-time setup, and the wide field of view makes it easy to spot and track targets. The powerful prisms float in flexible silicone mounts, protecting them against impact, and the Makrolon polycarbonate casing features rubber armor for even greater shock protection. The chassis is fully nitrogen-purged to prevent water intrusion and fogging in all temperatures and weather conditions. It can be mounted on a tripod for hands-free use, but is also light and comfortable enough for handheld applications. The top-mounted compass also makes these binoculars a valuable navigation tool, and features HD stabilization to come to rest more quickly. 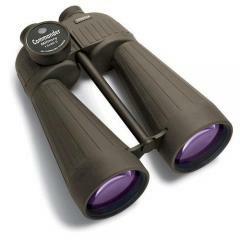 ©2002-2019 CopsPlus.com: Steiner Optics 416 Military 15x80 Model 416 Binoculars with Compass FREE SHIPPING!